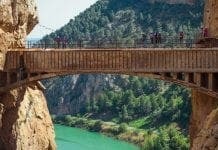 IT may be Andalucia’s most hotly anticipated tourist attraction, but the revamped Caminito del Rey has not pleased everyone. 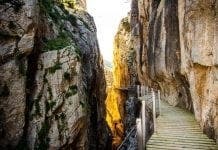 Dubbed the ‘world’s most dangerous walkway’, the days of thrillseekers taking their lives into their own hands are well and truly over. And for some frequent visitors, that is a ‘tragedy’. “There were previously lots of routes above the caminito for climbers, which will now be off limits,” British climber Sarah Brown, who took on the old Caminito five times, told the Olive Press. 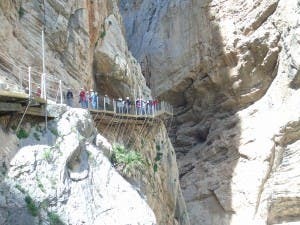 The official line is that climbers will be allowed to climb beneath the walkway but will be prohibited from climbing above due to the risk of falling rocks. Fellow Brit Matthew Doye added: “Wherever there’s a beauty spot that gets turned into a tourist attraction, climbing gets banned. To see more pictures of the newly renovated walkway, click here. certain family members, some neighbors, all Politicians, Bank Officials … etc to “visit” this! ps, since ALL “bad things” also offer an opportunity – invest in funeral parlors & cemetaries ! yeah…good place to take your enemies.